This is the view I'm greeted with when "Peanuts" comes around looking for a treat. Isn't she cute?! She's adorable with her big eyes. is she eating out of you hand yet. They are smart little buggers. 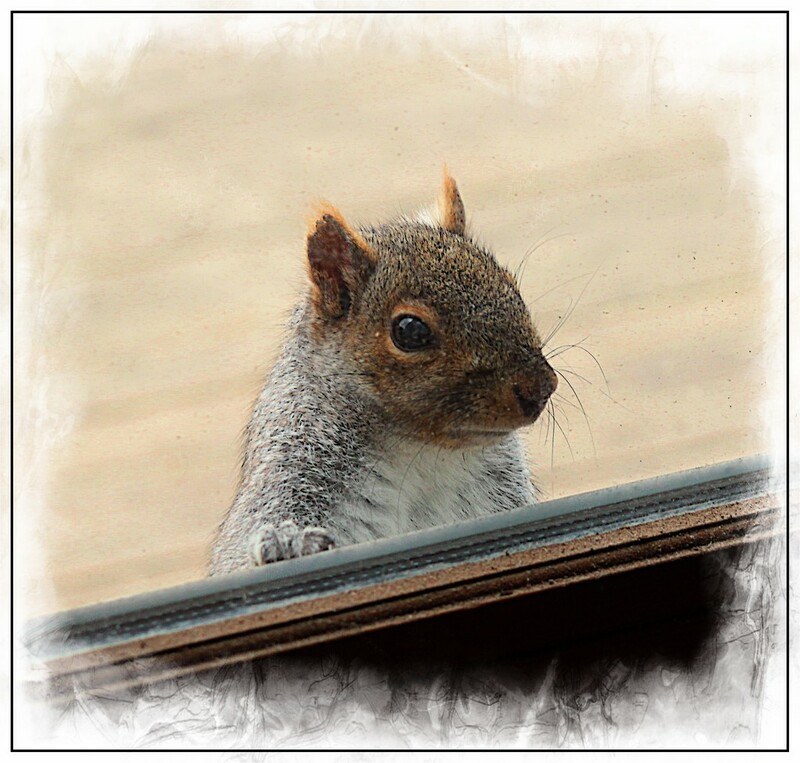 We used to watch the woodpeckers hide acorns under the shakes of our neighbor’s house and then the squirrels would hide under the eve and sneak their paw around the edge to get the acorn. The woodpeckers could not figure it out. Love the edging and background. Enhances without taking anything away from the focus of the squirrel. Ha! Very cute. Nice capture. Love the way you processed this. She almost looks as if she is reading a book here! She is so cute! Great portrait of her, and great processing. This is precious and I can imagine her tapping her watch to let you know dinner is late! Oh yes, very cute indeed. We don't have squirrels, saw my first last year in Sri Lanka. She certainly is cute. Beautiful capture. I hope she got the treat. LOL Love your title and this is so cute. Thank you for the favs Denise, Joanna, Marilyn, Kerri, Doreen, and Milanie! Peanuts thanks you too! Thanks to all and yes, any time Peanuts shows up, she gets plenty of peanuts! I have a jar of them just for her by the back door. A beautiful close up portrait capture. @FBailey Thanks for the fav Felicity! Peanuts is just so gorgeous!! lovely image. @robz Thank you Rob and thanks for the fav!